افتخار, یاسمین. (1392). طبیعت شهر رویکرد هویت‌گرا در پارک هوتن شانگهای. 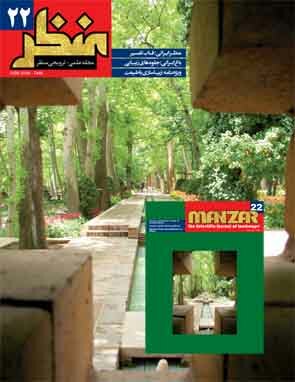 مجله علمی-ترویجی منظر, 5(22), 56-59. یاسمین افتخار. "طبیعت شهر رویکرد هویت‌گرا در پارک هوتن شانگهای". مجله علمی-ترویجی منظر, 5, 22, 1392, 56-59. افتخار, یاسمین. (1392). 'طبیعت شهر رویکرد هویت‌گرا در پارک هوتن شانگهای', مجله علمی-ترویجی منظر, 5(22), pp. 56-59. افتخار, یاسمین. طبیعت شهر رویکرد هویت‌گرا در پارک هوتن شانگهای. مجله علمی-ترویجی منظر, 1392; 5(22): 56-59. چکیده رودها از مهم‌ترین عوامل شکل‌دهنده ریخت شهر و دوام و پایداری زیست آن هستند که به عنوان یکی از مهم‌ترین مؤلفه‌های طبیعی هر شهر نقش مهمی در تداوم هویتی آن بازی می‌کنند. این اندام‌های طبیعی از زمان صنعتی‌شدن شهرها تا مدت‌های طولانی مورد بی‌توجهی قرار ‌می‌گرفتند و به فضایی آلوده و خالی از زندگی اجتماعی تبدیل ‌شدند. در این میان در برخی موارد برای برطرف‌کردن آلودگی رودها تصمیمات نادرستی از سوی مدیران شهری گرفته می‌شود که تبعات منفی ناشی از آن پس از مدتی نمود پیدا می‌کند. نمونه بارز این برخورد، پوشاندن کامل رودهای آلوده در شهرهاست. در نتیجه نه تنها نقش رودها در ساختار شهر از بین می‌رود، بلکه جایگاهشان را نیز در ذهن و خاطرات مردم از دست می‌دهند. امروز اهمیت حضور طبیعت و مؤلفه‌های آن در شهر مدیران شهری را به سمت نگاهی متفاوت به این اندام‌های به ظاهر مخرب و تهدیدکننده در راستای بهره‌گیری و باززنده‌سازی اکولوژیک و اجتماعی آنها واداشته است. رودخانه هونگپو در شانگهای یکی از موفق‌ترین نمونه‌های این برخورد متفاوت با رودخانه‌ای درون شهری است. مشکل بزرگ این رودخانه، آلودگی بیش از حد آن بود به گونه‌ای که هیچ موجودی قدرت ادامۀ حیات نداشت. به این ترتیب مدیریت شهری در پروژه‌های مختلف حوزه این رود از جمله پروژه طراحی پارک هوتن، برطرف کردن و بازگشت نقش اکولوژیک و طبیعی رود در شهر شانگهای را هدف اصلی خود قرار داد. «کونگ جیان یو» طراح این پروژه که به واسطه رویکردهای ویژه اکولوژیک و زمینه‌گرایانه‌اش شهرتی جهانی دارد، ایجاد پیوندی پایدار میان مخاطب و بستر طبیعی رود را به عنوان هدف اصلی خود در پروژه در نظر گرفت. در این راستا برای باززنده‌سازی و احیای رود در شهر و زندگی مردم، از مؤلفه‌های مختلف فرهنگی و خاطره‌ای در مسیر رود بهره گرفت. .A. in Landscape Architecture, International University of Imam Khomeini, Qazvin, Iran. Rivers are among the main factors in shaping the urban morphology, city’s identity continuity and environmental sustainability. Since the industrialization of the cities, natural features such as rivers were neglected and turned into contaminated places with no sign of life. In some cases, negative consequences were arisen due to inappropriate decisions made by the urban leaders for eliminating the pollution from the rivers by various methods such as covering the contaminated rivers in the city, which caused people forget these natural features which eventually lost their role in urban structures. However, whereas the importance of nature presence has been discovered in modern world, urban leaders are trying to make significant use of the natural sources and their social and environmental rehabilitation. Huangpu River in Shanghai is one of the most successful examples of these types of approaches toward the inner city rivers. The widespread contamination of the river which made it an uninhabitable location for any type of creature was the main problem. Therefore, urban management team implemented the purpose of its various projects (such as Hooton Park) toward the ecological rehabilitation of this river. KoungJian Yu, the project designer who is renowned for his ecological approaches, had a profound understanding of the condition of this river. Apart from solving various challenges of this site, he tried to create a sustainable landscape which reminds people of the Chinese culture and traditional agriculture. He has not forgotten the history of the site and has creates a combination of the tradition and modernity in a very pleasant way by the use of all the industrialized means in the site. Moreover, with these approaches he has also created a place for recreation and leisure activities for the people. Yu’s approaches in landscape projects have had a very significant role in rehabilitation of the city. His main focus is on sustainable development of the site and its surrounding environment. Indeed, he also pays a great deal of attention to the Chinese culture and landscape which causes him prosperity and success in his projects. In Hooton Park project, natural features of the ecosystem were maintained and the connection of human beings with their identity and history was made by the rehabilitation of the nature. This way of thinking and decision making which solves all the various types of issues in an urban environment are the main reasons for the success of this project and its being entitled as 2010 best project by the American Architecture Community.